Senior Strategy Advisor and Smart City Ambassador, Amsterdam Smart City. 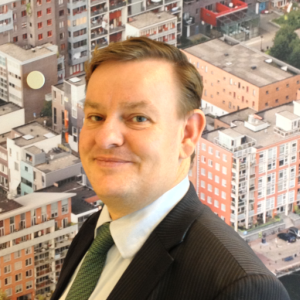 Since 2008, Frans-Anton Vermast is a Senior Strategy Advisor and Smart City Ambassador Amsterdam Smart City. He is an expert in searching for the opportunities of novel appliances and services that make cities a more habitable place for its citizens to live, work and play pleasantly. Furthermore, he specialises in developing Smart Cities as open and user-centric innovative platforms as well as holistic and cross silo approaches through collaborative bottom-up approaches and citizens engagement. Apart from best and next practices, Mr Vermast is not afraid to share some failures and lessons learned to prevent other cities making the same mistakes. His objective for working in projects like Smart Work, Smart Grids, Smart Living, Smart City and Smart Mobility is to create a more sustainable and livable environment and boost social and economic benefits that will result in more happy citizens. From this role Mr Vermast is active in several roles within City Protocol: member of Board of Directors, thematic Area Director Society and Director Public Affairs. He is a visiting speaker at Leiden University & Radboud University Nijmegen and guest lecturer at the Universities of Applied Sciences of the Hague and HAN. He also has a great global training experience both professional and as a volunteer for the Liberals. He is also a sought-after moderator and day chair for all types of conferences.